O’Connor was restored to the starting line-up with Marcus Kelly ruled out due to a thigh injury and the big moment arrived as the game looked to be heading for a goalless draw. 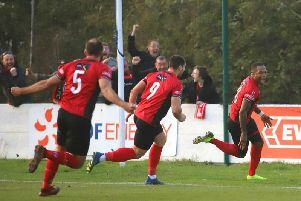 Second-placed Stourbridge were held to a 1-1 draw by St Ives Town but O’Connor popped up with the priceless goal in the fourth minute of injury-time to send the Poppies 13 points clear at the top with just five games remaining while the hosts finished with 10 men when Noel Aitkens was sent-off after the winning strike. It all means that Kettering will be crowned champions if they beat Alvechurch at Latimer Park next weekend although, such is their advantage, if Stourbridge were to lose at Needham Market then that would also be enough to seal it. AFC Rushden & Diamonds’ play-off hopes suffered a setback after they were held to a 0-0 draw by Royston Town at Hayden Road. Andy Peaks restored top scorer Tom Lorraine to the starting line-up with Jack Bowen dropping to the bench. In an even first half, it was the visitors who had the best chance when James Potton went through on goal but was denied by a good save from Ben Heath. After the break, Diamonds went close with Ben Farrell being denied by a good stop and he also sent another effort narrowly wide. However, Royston went close themselves late on when Gus Scott-Morris struck the bar with an overhead-kick. 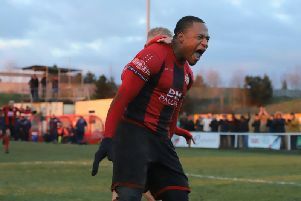 But there was to be no breakthrough and Diamonds will now turn their attention to the NFA Hillier Senior Cup final as they take on Brackley Town at Northampton Town’s PTS Academy Stadium on Tuesday night.